Technology today makes it possible for various forms of alloy wheel refurbishment, such as bolted wheels and split rim wheels to undergo previously restricted repair work. Due to the service we can provide at Ken’s Autos, more vehicle owners are routinely undergoing alloy wheel refurbishment for their vehicle. This not only keeps them looking pristine, but also adds to the value of your vehicle. We are now also able to colour code a lot more effectively than before. 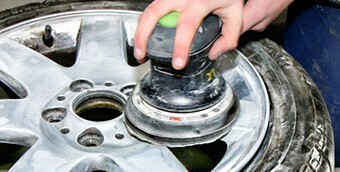 Colour coding is the basic process of matching the vehicles bodywork paint to the alloy wheel. Using advanced systems we can effectively match bodywork colours and provide unique colour coding options. Contact one of our Croydon garages today to find out more about any of our services offered for the surrounding areas, including Sanderstead and Selhurst. To contact us, simply visit our contact page. Why not change the colour of your wheels? Choose from any colour you like or even send us a colour to match. All 4 wheels fully refurbished and sprayed in the colour of your choice. Our fully equipped, Ken’s Autos workshops can carry out a range of alloy wheel refurbishments and repairs. Just pop in and see us, or call to arrange to have your vehicle collected if needs be. We will always carry out a final inspection, the process is then complete and your vehicle is ready to drive. Payment is made upon inspection of our work. If your alloys cannot be repaired for any reason, we will not charge you. If you’d like to hear more about what Ken’s Autos can do for you, please get in touch by clicking the button below, or calling us on 01883 622 069 for our Warlingham garage or 0208 763 0102 for our Whyteleafe garage. We service Croydon, including area like Selhurst and Sanderstead.